The portrait of a starving MC, Bronx-native Nine got his big break in late 1993 as a featured guest on Funkmaster Flex and the Ghetto Celebs' "Six Million Ways to Die." The verse showcased Nine's harsh, gravelly flow and the artist was signed a deal with the now-defunct Profile Records. 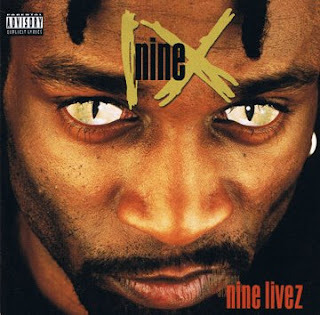 Nine's debut album, Nine Livez, appeared in early 1995 on the strength of the up-tempo single "Whatchu Want." While the album did not make a big splash, it spawned a slew of underground hits including "Redrum," "Everybody Won Heaven," and "Any Emcee," which tastefully borrowed from the Spinners' "I'll Be Around." Nine's signature black lung vocal tone drew some comparisons to the over-the-top antics of Busta Rhymes. Nine followed up with Cloud Nine in 1996, then mostly fell off hip-hop radar screens when Priority closed up shop. During his hiatus, Nine popped up on the TV series NY Undercover landing a bit part as a thug. In late 2000, the Bronx MC hinted at a comeback, releasing the single "It's Ugly..."
Debut album from the gravel voiced Nine. Very hard to come by and for those that slept on this release, make sure you check out one of the best hip hop albums from the mid 90's, this is a definite gem that you should all have it in your collection!